MnDOT is testing a mobile road condition monitor that uses infrared technology to detect hazardous ice, snow or wet conditions without even touching the pavement. Maintenance crews hope the device, called the High Sierra Surface Sentinel, could help them better determine when it’s time to apply salt when they’re plowing. 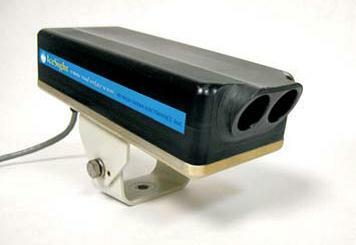 The mobile sensor reports air temperature, surface temperature and road friction data. 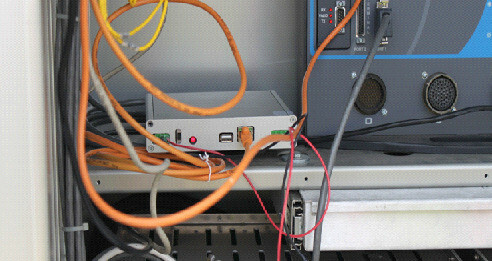 The device being tested by snow and ice crews in northern Minnesota would also provide real-time surface weather conditions. Currently, plow operators and supervisors must enter road conditions into a computer or relay them by phone, a time-consuming process that operators are not always able to perform in a timely manner. The biggest potential benefit, however, is lower salt consumption. “Sometimes you get a light cold snow event where it might look like there’s a little ice on the road, but, in fact, you have good friction numbers and you don’t need salt. Once you put chemical down, you’re committed to it,” Huneke said. District 1 snow and ice crews are evaluating the unit pictured below for its accuracy and effectiveness in determining slippery conditions. It will be compared with another device tested in District 3 that also uses infrared technology to determine how slippery the road is, and technology being tested in District 6 that uses gravitational force to determine the road surface friction. 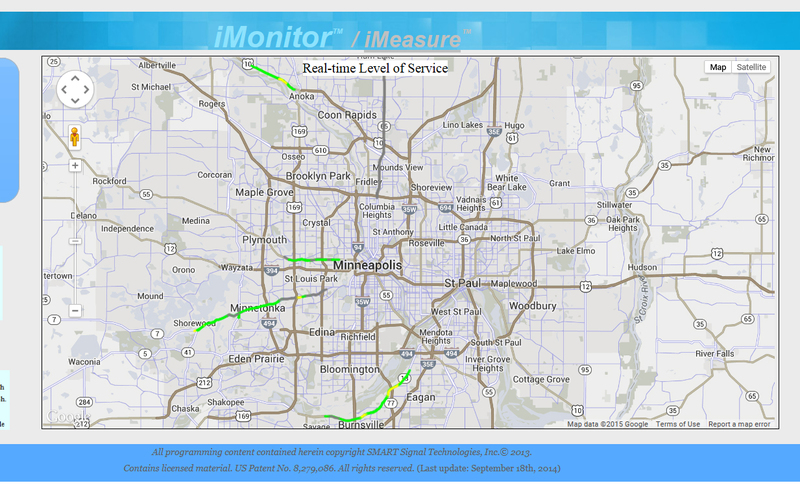 MnDOT it testing this mobile road condition sensor, which provides real-time surface weather condition of roadways. If the plow pictured above looks like two different plows welded together, it’s because they are. Minnesota Department of Transportation snow plow operators in southwestern Minnesota have invented an experimental plow that uses the wind to cast snow from the road without impeding traffic or the operator’s view. Manufactured for MnDOT by Fall Plows, the plow incorporates half of a traditional bull-dozer style plow with half of a Batwing-style plow. It eliminates the large “ear” on the driver’s side of a Batwing style plow that can stick out into oncoming traffic during center-line snow removal. Half of the reversible batwing-style plow, pictured at left, was combined with half of the reversible bulldozer-style plow, at right. 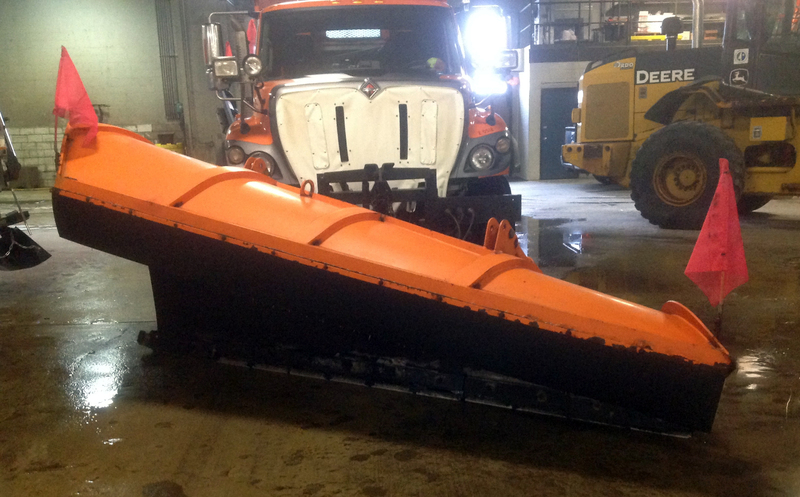 District 8 Willmar Maintenance Supervisor Dennis Marty said he was looking for a reversible-style plow that could be used in the heavy winds and reduced visibility from blowing snow that are prevalent in western Minnesota. When drivers are plowing against a northwest wind in rural Minnesota, the snow coming out of the chute will sweep across the truck and blind drivers, so operators needed a plow with a reversible system so they could throw the snow with the wind. While an express plow with chutes on both ends (batwing-style), pictured above at left, was great for throwing snow to the right, when snow plow drivers took it down narrow two-lane roads, the plow stuck 2.5 feet into the oncoming lane and its big barrel partially blocked the headlights and the operator’s view. So operators tried a regular one-way plow (pictured below), which resembles a funnel laid on it side, and put it on a reversible system that would allow operators to turn the plow both directions, so it could throw snow to the right or the left. However, this plow couldn’t blow snow high enough to the left, so snow piled in the left traffic lane. Marty said he spent four to five years looking for a plow that combined the batwing and bull-dozer designs, but he couldn’t find anything sturdy and maintenance-free enough. Finally, he and Maintenance Research Program Administrator Ryan Otte sat down with Falls Plows in Little Falls, Minnesota and asked the company to build one. The plow will be useful on low-volume roads that have little traffic during the middle of the night, which allows plow operators to cast the snow with the wind. The Willmar office began using the experimental plow last winter and will be replacing all of its plows with it. Snow plow drivers from other areas of the state have been so impressed that at least two other maintenance districts have also ordered them. Just how long will it be before a bridge deck needs to be rehabilitated? Why not look to history to find out? Researchers have put several decades of MnDOT bridge inspection records to good use by analyzing old bridge deck condition reports to calculate how quickly similar bridge decks will deteriorate. MnDOT inspects bridges regularly, but had never used this historical data to help determine the rate of bridge deck deterioration and what factors influence it. “We’re always trying to improve the timing of bridge deck repair projects and improve our understanding of what contributors affect the way our bridge decks deteriorate,” said Dustin Thomas, MnDOT’s South Region Bridge Construction Engineer. From their analysis, researchers created deterioration tables that can be used to better predict the timing and costs of repairs and maintenance. Researchers looked at the inspection history and construction details of 2,601 bridges to determine the impact of factors such as type of deck reinforcement, depth of reinforcement below the driving surface, traffic levels and bridge location. Using the inspection data, researchers developed curves that show how long a bridge deck is likely to stay at a given condition before dropping to the next. They developed separate curves for each variable that had a significant impact on deck deterioration rates. Decks without epoxy-coated bars built between 1975 and 1989 deteriorate more quickly than other bridge decks. Bridges with less traffic showed slightly slower rates of deterioration than highly traveled bridges. Metro area bridges drop to a condition code of 7 (good) more quickly than bridges in other parts of the state. This may be due to increased chemical deicer usage or because maintenance activities like crack-sealing are more likely to be delayed on larger metro bridges because of the difficulty accessing middle lanes. When a new deck is installed on an existing bridge, the deck performs like a brand-new bridge and so MnDOT should use the deterioration table for the re-decking year, rather than the year the bridge was originally constructed. 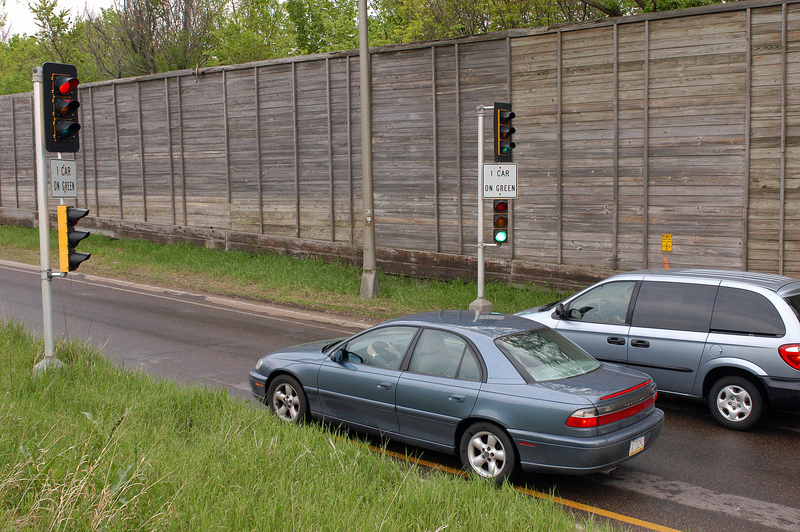 MnDOT plans to incorporate future bridge inspections into the dataset to enhance the predictive value of the deterioration tables. 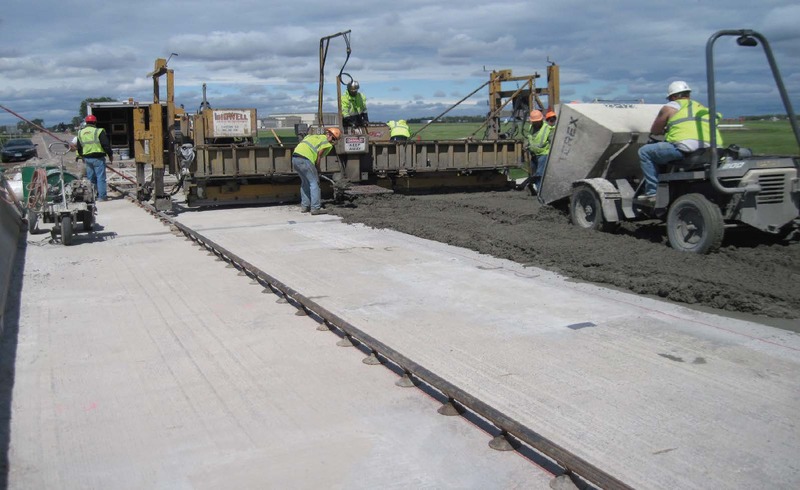 The impact of overlays on bridge deck deterioration in Minnesota was not clear, but redecked bridges were found to perform similarly as brand-new decks. The nation’s two largest pavement test tracks are planning their first-ever co-experiments. 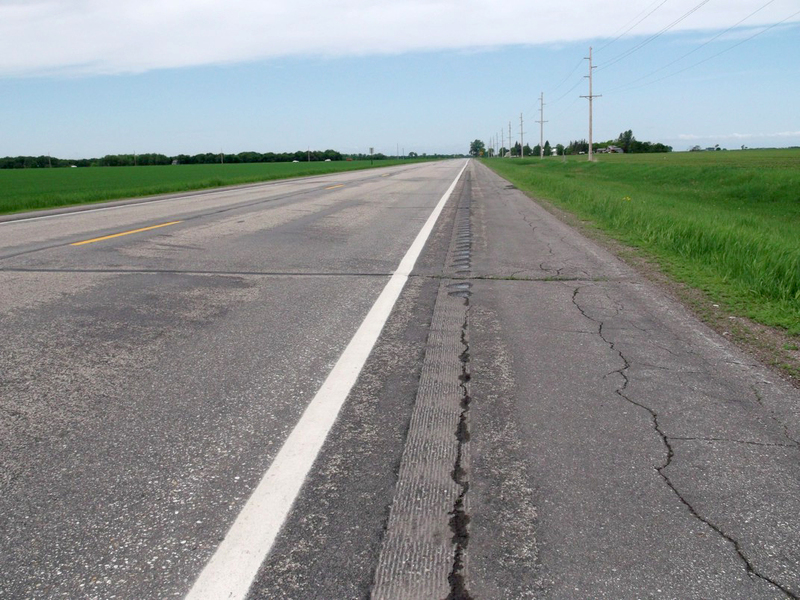 The Minnesota Department of Transportation’s Road Research Facility (MnROAD) and the National Center for Asphalt Technology (NCAT) began discussing a formal partnership last year and have now asked states to join a pair of three-year research projects that will begin this summer. Representatives of the test tracks are meeting next week in Minneapolis at the 19th Annual TERRA Pavement Conference. They said the partnership will develop a national hot mix asphalt cracking performance test and expand the scope of existing pavement preservation research at the NCAT facility in Auburn, Alabama, to include northern test sections in Minnesota. MnROAD plans to build test sections at its facility and also off-site on a low- and high-volume road, which may include concrete test sections if funding allows. These Minnesota test sections will supplement 25 test sections built by NCAT on an existing low-volume haul route in 2010 and an off-site high-volume test road planned for this summer in Alabama to assess the life-extending benefits of different pavement preservation methods. Both agencies have also been developing performance tests to predict the cracking potential of asphalt mixes, and they will now work together on that research as well. “We will collect and analyze the data in similar ways, and I think we’ll have a greater appeal nationally, as we cover a range of climate conditions,” said MnROAD Operations Engineer Ben Worel. Participation in the pavement preservation study is $120,000 per year for the initial research cycle, which will drop to $40,000 after three years; the cracking study will run three years at $210,000 per year. Alabama will be the lead state for this effort. State departments of transportation are asked for commitment letters this month if they are interested in joining either study, even if they do not have SP&R (State Planning and Research) dollars available at the time. Participating agencies will get to design the scope of the research and be kept advised of the ongoing findings, so they can benefit early from the project. Initial planning meetings will be done through a series of webinars in March and April of this year with participating agencies. At a January 8 webinar, speakers said the research will help states determine how long pavement preservation treatments will last. “Many DOTs have really well-designed and well-thought-out decision trees, where they can take pavement management data and end up with a rational selection of pavement alternatives. But the issue of extending pavement life is the really big unknown, because references provide a broad range of expected performance,” NCAT Test Track Manager Buzz Powell said. Another benefit is that states can learn how pavement treatments hold up in both hot and cold climates. For additional information, contact Ben Worel (ben.worel@state.mn.us) at MnROAD or Buzz Powell (buzz@auburn.edu) at NCAT. Aerial views of the pavement test tracks at MnROAD (left) and NCAT (right).